Wednesday is the best day of the week because that’s when the new comic books arrive in stores. Here are some of the comics scheduled to hit the shelves on September 28, 2011. Your local retailer will probably have these and others, so make sure to check with them for more details. The book I'm really looking forward to this week is DC Comics (DC Comics like CNN are owned by parent company Time Warner) Aquaman #1. I have been an on-and-off-again fan of the title for years but when I heard that Geoff Johns was writing it, I was excited to see his take on this classic DC character. We had the pleasure to talk to Johns about Aquaman #1 and he had some interesting things to say. 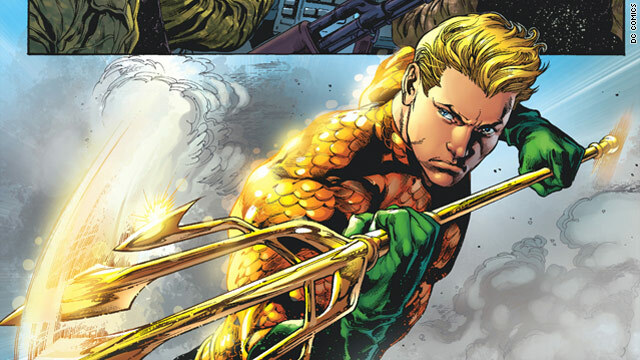 CNN Geek Out: Will there be a new attitude to the new Aquaman? Geoff Johns: Hopefully the book will take Aquaman and tell stories that have never really done before ... both in the sea and on land. CNN Geek Out: What's the first big difference in the storytelling that fans will notice? Johns: We tackle what people think Aquaman is already right off the bat. We don't try and over compensate for him being Aquaman ... he is very much a character that is an underdog in the world of super heroes. CNN Geek Out: Will there be much carry over from the Flashpoint story lines? Johns: No, there won't be too much carry over from the Flashpoint story line; his looks carry over some but that's about it. That's what I am excited about. What comics are you looking forward to this week? Is there a comic out there you're really loving? If so, let us know in the comments. We are always looking for tips on good books! I'm interested in seeing where Ultimate Comics Spider-Man goes. I'm gonna attempt to read the new DC books. I think I gave up too easily. I have to check out more Marvel title I don't read as many of them as I would like LOL. Yes I think you should give the new 52 a 2nd shot I think the suffer a lot from the #1 book problem and hopefully will get beter as they go along.